After getting my paternal ancestry test results, I am now all gung-ho about hunting via the DNA route. This time, I found my mom’s mom’s mom’s … mom’s mom. Maternal lineage tests are derived from mitochondrial DNA (mtDNA) which is passed from a mother to her children — both male and female. This test is a powerful investigative tool for researching the maternal line and identifying one’s maternal ancient ancestry. From Africa, through China, to the Americas. I am blown away at how I share DNA similarities with a group that has literally roamed the earth! 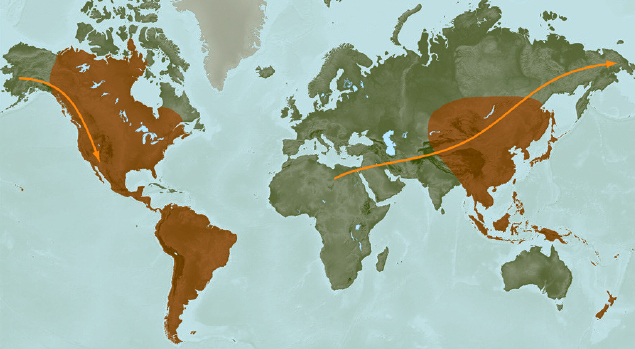 Haplogroup B is also referred to as THE JOURNEYERS. I entered the values into Mitosearch, and compared my DNA makeup with many others on record. I found that I share ancient maternal ancestry with people from Argentina, Barabados, Bolivia, Brazil, Cambodia, Canada, Chile, China, Colombia, Costa Rica, Cuba, Ecuador, England, France, Germany, Guatemala, Hungary, Korea, Indonesia, Italy, Japan, Kazakhstan, Madagascar, Mauritius, Mexico, New Zealand, Panama, Peru, Philippines, Puerto Rico, Samoa, Slovakia, South Africa, Spain, Thailand, United States, Uzbekistan, Venezuela, and Vietnam. I am looking forward to reading a novel called “The Seven Daughters of Eve” by Brian Sykes, which is describes the lifestyle of the Journeyers in a rich narrative surrounding their ancestral mother, whom the author called “Ina”. It is so cool how that means mother in Tagalog. If you are my San Diego, Porcincula, De Leon or Concepcion relative, give me a holler if you want a copy of the full report. You belong to the Journeyers, Haplogroup B, which emerged around 50,000 years ago during an initial migration from Africa into Asia. The Journeyers most likely mapped this migration directly through Central Asia. About 12,000 years ago some of the Journeyers migrated into the Americas across the Bering Straight land bridge. Because of this migration, the Journeyers have been associated with Native American populations at rates of about 24%. Many of the descendants of the Journeyers are found among Native Americans in the southwestern United States, known for its cactus-covered, arid desert. Native tribes of the American southwest include the Apache, Hopi, Navajo and Zuni, among others. The people known as Apache are actually a gathering of different tribes who have, over time, become regarded as a single group. There are significant differences among the Apache tribes, but there are also notable similarities. Among the broad Apachean cultures shamans play a key role, although the ceremonies they lead and participate in may vary. The Hopi people are called Hopituh Shi-nu-mu in their language, which translates to “The People of Peace.” Peace is central to the Hopi’s cultural and religious beliefs. A matrilineal tradition gives structure to the Hopi society and means that when a man marries, he joins his wife’s family. Kivas, square spaces used for spiritual ceremonies, have been used by Hopis since ancient times for ritual prayers, dances, and sacred chants. There are also many Journeyers in the southern Siberian regions, and in and near present-day Mongolia and China. Your ancient ancestors may have lived in these regions as well. Among these people are the Tuvans, a nomadic people who live in yurts and herd reindeer, yaks and cattle and are known for their enchanting throat singing. The Buryats and the Altay also live in this general region and have notable rates of Journeyers among their populations. There is evidence that the Altay mastered metalwork almost 2,000 years ago. Over the 50,000 years since your ancestors emerged, they have traveled around Asia, and descendants of the Journeyers can be found in Taiwan, Korea, Japan, Indonesia, Polynesia and Micronesia. its not surprising if one can find his lineage in the farthest part of the world. this is one of the most challenging work for any researcher. however, enjoyable and quite expensive, i should say. this work is a nice legacy anyway for future references. This is truly an amazing research! My maternal grandmother’s name is Cerma Porcioncula, who was born in San Pablo City, Laguna. From what she told me, their family name used to be Geronimo and her father or grandfather had it changed to Porcioncula after the Spanish fled the country to avoid the wrath of the locals, as they were of Spanish descent. Thanks for the visit to my site, Veejay! Hello Ms. Mona, I am intrigued with your findings regarding your de Leon lineage. I am just starting my family history research and have little to go on. I will be doing a DNA test through the ancestry.com program and am interested in knowing whether we may be distantly related. I have family there in San Diego, my uncles have lived there for many years in Mira Mesa and Chula Vista. My parents are also living there temporarily. I will be in touch with you once I get the DNA results. Thank you for sharing this in the online community. Thanks, Geraldine! I have uploaded my numbers up on ancestry.com’s database. As genealogy is not very big in the Philippines, not a lot of Filipinos take the DNA test for this purpose. Hope to find some connection, especially on the lines I have very little research on. Cheers!